Ana is a Support hero in Overwatch. Shots pass through full health allies and do not affect them. Scoped shots leave a tracer behind. If a sleeping target takes damage, the target will wake up prematurely in 0.5 seconds. Affected allies receive 50% additional healing, including from Health Packs. Affected enemies cannot be healed. After Ana hits one of her allies with a combat boost, they deal more damage, take less damage from enemies’ attacks. Ana passively generates 1% Ult Charge every 3.75 seconds. Damage reduction does not stack with other damage reduction abilities, as it is capped at 50%. Ana is a mid to long-range Support sniper, capable of healing at any range while also maintaining a fair level of damage output. Her Biotic Grenade lets her amplify healing effects from not only her own healing darts but also from other Supports and environmental healing, such as Payloads and Health packs. She has a sidearm which will fire a Sleep Dart, which can render the enemy who's hit with it temporary useless unless someone wakes them up. Nano Boost is a supportive ultimate that is used to provide strong buffs to an ally, allowing them to deal more damage while taking less damage from the enemy. She can also be an anti-healer as her Biotic Grenade will prevent enemies hit by the blast from getting healed in any way, making her an outstanding support. Ana lacks all source of mobility and only has her sidearm to protect herself, making it easy for her to be outflanked by the flankers as well as other mobile heroes. Biotic Rifle : Ana's primary weapon. It carries fourteen rounds in a single clip and is able to affect both teams, healing allies for 75 HP and dealing 70 damage to enemies. It comes equipped with a scope which makes Ana's shots hitscan at the sacrifice of vision of her surroundings and movement speed. Ana's rifle is unique in that it deals its damage and heals in rapid segments, rather than all at once. Even it deals 4 rapid segment within 1 shot, the damage over time effect is not mitigated by armor. 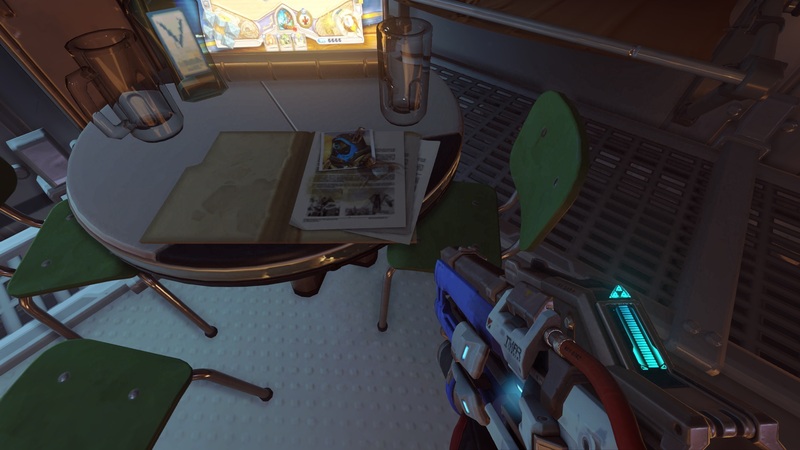 While Ana does relatively less damage compared to other snipers, the Biotic Rifle allows Ana to switch back and forth from the roles of combatant to healer, similar to Moira. Only scoping when you have to do. When unscoped, your shot will be hardly visible for the enemy team to find your location. With scoped, it leaves your shot a bullet tail which reveal where you are firing from. Considering use a quick-scope in order to minimize the time you reveal your position and effectively burst an ally from long-range when needed. Even though it is a sniper-rifle weapon, it can't deal a critical shot. This makes it pointless to try hitting headshots. Sleep Dart : Ana's sidearm. It is her personal anti-flanker tool. Firing a single projectile that travels at high speeds, it will inflict the Sleep status effect on an enemy. While asleep, one cannot move, attack, or use abilities, and audio will sound lower-pitched and distorted. The effect lasts for five and a half seconds, but can be cut short by any amount of damage. Sleep Dart deals very little damage to the target but can still kill them (trying to get a kill with a Sleep Dart is not advisable). Sleep Dart is excellent at mitigating channeled ultimate abilities such as Genji's Dragonblade or Soldier: 76's Tactical Visor, and can make the work of large, mobile tanks who often attack snipers much harder. Ana must be in constant communication with her allies to get the most out of Sleep Dart. Any amount of damage, whether it be a stray bullet or an explosion, is enough to rouse one who is under Sleep Dart's effects. Much like with Mercy's Resurrect, certain targets are of a higher priority than others. Along with enemies using ultimate abilities, your main targets should either be enemy tanks or an immediate threat to your team. Do not try to use Sleep Dart on faraway enemies. Biotic Grenade : The Biotic Grenade will heal reasonable health upon being cast, and during its four seconds of duration will increase the healing rate of any allies hit by the grenade by 50%. Meanwhile, the enemies hit by the grenade will be damaged and unable to receive healing at all for the duration. The grenade is the only way for Ana to heal herself outside of health packs. The Biotic Grenade is a fantastic tool for healing heroes with large health pools. Under the increased healing, a critically injured tank will only require a few darts to get back into the fight. The grenade also serves well as an emergency burst heal for both allies and Ana herself, should an enemy flank them. The blast radius of the grenade is fairly small, so one should throw the grenade directly onto teammates as opposed to near them. It can still be helpful to use its blast radius to hit targets otherwise unreachable; for example, throwing the grenade at a wall behind Reinhardt's shield, rather than directly at him. Biotic Grenade is a strong ability to use in team fights, throwing directly to a group of enemies and allies alike will dramatically gain an upper hand. Biotic Grenade can both counter an enemy Zenyatta's Transcendence, and synergize with a friendly one. The grenade is a surefire way to counter Wrecking Ball's ultimate, as it deals more damage to the mines than they have health. Nano Boost (Ultimate): Ana's Ultimate ability. Ana will temporarily embolden an ally, giving them 50% increased damage and immunity to 50% of all incoming damage for 8 seconds before it expires. It also instantly heals 250 HP. Nano Boost can't be missed; It ignores Genji's Deflect and D.Va's Defense Matrix. While under Nano Boost's effect, one's character model will glow either red (for enemies) or blue (for allies). Try to save Nano Boost for allies with available ultimate abilities. Soldier: 76, Reinhardt, Genji, and Roadhog are all excellent choices for a Nano Boost. Certain ultimates (such as Hanzo's) will not be affected by Nano Boost. Remember that Nano Boost instantly heals 250 HP on use. Consider your situation when you have it available; would it be better to save an ally at critical health, or boost another teammate's damage? While Ana has reasonable to outstanding damage capabilities like other damage dealers, she is unable to deal any critical shots and suffers from low mobility. You must focus on healing your allies rather than playing like DPS-heroes; you can't act like them well on your own. Ana can provide more healing than other supports due to her fast fire-rate and Biotic Grenade. Playing her as a sole support will lead the enemy to prioritize you as the first target, so additional supports are recommended. Ana is a sniper class, which is deadly at attacking the enemy from extreme range. You can kite the enemy that your teammates can't attack back like rivaled snipers or airborne targets with ease. Keep in mind that you can't deal a critical shot nor heavy damage that will put them in lethal levels instantly, so try to stay in cover or a friendly's barrier. Biotic Grenade is a strong counter to all healing effects; such as Roadhog's Take a Breather, Zenyatta's Transcendence or even an opposing Ana's Biotic Grenade. You can throw the grenade directly to the enemy and contact your teammates to gang up on the effected target as they can't be healed. Missing a Sleep Dart to flankers will result in your disadvantage. Try to practice your aim and adjusting the dart's speed. Sleep Dart > Biotic Rifle shot > Biotic Grenade > Quick Melee. Combo damage is 165, enough to take out a flanking Tracer. A target under the effect from Sleep Dart will be rendered useless and unable to make any actions. If your combo can't finish the target, communicate your team to do so. Reinhardt's Charge is a great choice to finish the target if he doesn't need to cover your team with barrier at that time. Don't let the other teammates interfere in your line-of-sight while activating Nano Boost on the target. You have to communicate with your teammates to whom you will give the ultimate and always have space in your line-of-sight, so you can avoid giving Nano Boost to a wrong target that can't bring your ultimate to any usefulness, such as Lúcio or Mercy. The common targets for your Nano Boost should be damage dealers rather than tanks. While boosting tanks will give them a better chance of surviving and greatly increase their damage, you will force them to move out of their position to attack the enemy, in order to not waste the damage buff gains from Nano Boost. Nano Boost works best when paired with damage dealing ultimates like Soldier: 76's Tactical Visor or Reaper's Death Blossom. Even though the Nano Boosted-hero will take less damage by 50%, the effected hero can still die if the enemies are focusing on the boosted-hero. Try to heal the boosted-hero continuously, so that they won't die in the most important engagement. As Ana can both heal allies and damage enemies, along with Biotic Grenade's amplifying healing; she can gain the ultimate charge quickly, so you can use the Nano Boost on your target to push or to defend depending on the situations much faster than other healers. One of the founding members of Overwatch, Ana uses her skills and expertise to defend her home and the people she cares for. Hailing from a long line of decorated soldiers, Ana inspired confidence and loyalty in her colleagues and endowed her daughter, Fareeha Amari — Pharah, with an intense sense of duty and honor. Like her daughter, she bore a tattoo of an Eye of Horus as a symbol of protection. Likewise, her callsign in the Egyptian Military during the Omnic Crisis was "Horus." Ana is regarded as one of the world's deadliest snipers. She originally used a Kinamura rifle, upon which she added a notch for every life she took. Each life weighed heavily on her conscience, and while some snipers preferred to wound targets, in order to lure out more potential targets, she preferred to perform clean kills, disliking causing needless suffering. Her right eye, originally cybernetic, made her vision six times greater than normal, to the extent where she rarely even needed to use the scope. While procedures exist that could repair her cybernetic eye, she feels comfortable with her eyepatch, seeing it as a reminder of who she is now. She continues to experience phantom pain from the eye injury. Even by her own admission, Ana is a poor cook and field dresser, having had to rarely use the latter skill. As the Omnic Crisis inflicted a heavy toll on Egypt, the country's depleted and undermanned security forces relied on elite snipers for support. Among them was Ana Amari, who was widely considered to be the world's best. Her superior marksmanship, decision-making, and instincts made her a natural selection to join the Overwatch strike team, of which she was one of the founding members. During the conflict, she was present in the battle at Rio de Janeiro. Overwatch successfully ended the war. During or after the Omnic Crisis, Ana took part in Operation White Dome. At some point in time, Ana met the wife of fellow agent Gérard Lacroix, Amélie Lacroix. Two weeks after Amélie was rescued by Overwatch from being kidnapped, Gérard was killed and Amélie was believed to have been kidnapped once again. Following the success of Overwatch's original mission, Ana served for many years as Strike Commander Jack Morrison's second-in-command. She raised her daughter, Fareeha, during this time, instructing her in martial arts. Despite her responsibilities in leading the organization, Ana refused to step away from combat operations. She was aware of her daughter's desire to join Overwatch herself, but Ana was against it. This led to a strained relationship between mother and daughter. At some point, Fareeha asked for a toy rifle, but Ana refused, telling her daughter that she'd shoot her eye out. She later came to regret her comments. She remained on active duty well into her fifties, and was stationed at Watchpoint: Gibraltar at some point. Ana was among those who helped take out the Anubis Project. However, she could come to regret Overwatch's actions, given the adverse effects it had on Egypt. “ You think we should get involved. Seven years before the present day, the King's Row Uprising occurred. Alongside Morrison and Reyes, Ana listened to Jesse McCree, who was on the ground in King's Row, observing Null Sector's actions. Ana asked Reyes what McCree was doing in London, since Blackwatch operations were suspended. Reyes evaded answering the question. To Ana's frustration, the prime minister still refused to allow Overwatch to intervene. In conversation with Morrison, Ana admitted wanting to do something, but while Morrison shared that desire, Overwatch had come under unfavorable scrutiny recently, and they could ill afford another public relations nightmare. Morrison relented, and sent agents Mercy, Tracer, Reinhardt, and Torbjörn to end the crisis. Ana gave status updates to the four agents. Ana's last mission was an anti-Talon operation conducted by Overwatch; part of a force led by Jack Morrison which rescued a number of scientists that Talon had taken hostage. While Overwatch was successful in this regard, the Talon operative known as Widowmaker was able to take out a number of agents. The operation led to a sniper duel between her and Ana, as they made their way throughout the urban terrain. Ana was able to temporarily incapacitate Widowmaker, hitting her in her helmet. But upon seeing Widowmaker's face, she froze, recognizing her as Amélie. It was all the time Widowmaker needed to take her own shot, shooting Ana through the scope of her rifle and into her cybernetic eye. It was believed that the shot killed her. In truth, Ana survived that encounter, despite being gravely wounded and the destruction of her cybernetic eye. The world believed that she was dead. She woke up in Poland with temporary amnesia, unable to remember who she was or how she was injured. She was treated under the Polish generic Janina Kowalski by Dr. Lee, where she requested to retain her anonymity as her memory returned. Lee obliged, and Ana was kept out of the system, which helped ensure that Overwatch failed to find her. During her months-long recovery, she was able to recall the details of the mission. She even let her daughter believe that she was dead, as she reasoned that Fareeha would expect "Captain Amari" to return home. However, with that moment of hesitation in her sniper duel with Widowmaker, she realized that she changed. Years later however, she'd come to regret her decision to leave Fareeha in the dark. Wrestling with the weight of a life spent in combat, she chose to stay out of the world's growing conflicts. She heard about the destruction of Overwatch Headquarters and the supposed death of Jack Morrison. However, she had her doubts as to whether he'd actually died. Ana ended up returning to Cairo. She'd originally planned to live quietly, so that she could be near her daughter. However, the longer she lived here, the more she realized that Overwatch was responsible for the problems plaguing Cairo. As time passed, she realized she could not sit on the sidelines while people threatened her city and the innocents around her. Thus, Ana rejoined the fight to protect her country from the forces that would destabilize it, and most importantly, to keep her family and her closest allies safe. She wrote a letter to her daughter, explaining her absence. However, she never received a response. Continuing her fight for justice, Ana operated under the alias of "Shrike," and was wanted for espionage, assault, and theft in Egypt. She used the Necropolis as her base of operations, and took care of the relics she found there before sending them to Dr. Hamid Faisal. She had come back to Egypt in part due to her guilt over the fallout of the Anubis project. Disguised as a masked bounty hunter, Ana sabotaged several Talon operations in Egypt, drawing attention from Reaper and his associate Abdul Hakim, as well as Jack Morrison, still alive despite his supposed death years ago. After days of lying in wait, she caught sight of Hakim in one of his palaces. The conflict came to a head when Ana and Morrison were lured into a trap at Hakim's compound in Giza, leading to a battle between the three former comrades. Though Ana sided with Jack and forced Reaper to retreat after unmasking him, she was disturbed by his visage and parting words, reminding her that Overwatch had been responsible for their suffering. Following the encounter Ana explained that she cared about Jack, not the war he was fighting, and resolved to watch over him as the two departed. Ana was left with the realization that Jack and Reyes were actually alive. Still, living or not, Jack had been wounded by Reyes. Hearing the sound of police sirens, they went to ground, staying out of sight. Still suffering from his wounds, Jack passed out, forcing Ana to take him to her base in the Necropolis. She gave him tea after he woke up. The wound was still giving him trouble, despite his enhanced healing abilities. Ana suggested that they contact Dr. Angela Ziegler, but Jack refused. The two discussed their pasts and their objectives—Jack was going after Reaper and Talon. However, he needed her help. Ana told him to rest first, and despite Jack's protestations, he passed out—Ana had drugged the tea. Jack was out for two days, over which Ana spent time gathering supplies. She explained her motivations for her actions in Egypt, but claimed that Jack's crusade against Talon was based on revenge. The two disagreed on how to approach things, with Jack focusing on the larger threat of Talon, while Ana wanted to focus on Cairo. Jack gave up and stormed out, leaving Ana alone to use his computer. She could see that Jack had been tracing Reaper's movements. Jack returned later in the night, and made a deal—he'd help Ana capture Hakim. After that, they'd go after Reaper. Ana accepted under the condition that they also apprehend Hakim's associates. Jack agreed. They were still in Egypt during Christmas. Within a week, they'd rounded up a number of Hakim's associates, whittling away at his organization. After the initial burst, Hakim went to ground, turning their hunt into a waiting game. On stakeout, they finally caught sight of Hakim, at which point Ana took out her Bastet mask. She explained that Jack's Soldier: 76 persona had inspired her. As "Bastet," she wouldn't be a hunter, but a protector. A week later, Hakim had been captured and his organization dismantled. Ana's actions as "Bastet" had caught the attention of Egypt's media, and even forced the government to act. At the Necropolis, Ana stated that she'd leave most of the items she'd collected behind, that they'd stay here until she found a caretaker. Jack asked her about Fareeha, pointing out that it would be awhile before they were in Egypt again. Ana gingerly replied that she'd left a message. Jack told her that Fareeha would come around in time. The two left the Necropolis, Ana still carrying her Bastet mask. Ana is Hero 22 and the first new hero added to the game. Ana's story draws parallels with the story of Horus from Egyptian mythology. During an altercation with a former friend (in this case, Widowmaker), she lost her eye. Additionally, both her and Pharah possess an eye of Horus tattoo. Her voice actress is an Egyptian woman who was recorded from Cairo. The voice actress's name, Aysha Selim, was not revealed until September 29, 2016 in a reply on the official forums. Ana was added to the PTR on July 12, 2016. She was added to the live PC version of the game on July 19, 2016. Ana is the sixth playable hero in Heroes of the Storm. Ana was the first hero added to the game after its launch. Blizzard began with the knowledge that they needed another healer, since Lucio and Mercy were showing up in every game. A concept was the Alchemist, a character who could drink from a decanter and then jump really high, or provide an extra-long heal over time. Meanwhile, the team were struggling to place the personality of Ana, which they’d conceived independently. Her backstory positioned her as a crack sniper, but the game already had Widowmaker. It was thus decided that the hero would be both a healer and a crack shot, using her rifle both offensively and defensively. The Alchemist concept was phased out within a few weeks. Influences for Ana's visual design were post-apocalyptic themes and imagery. The designers wanted to show her as someone who was rugged and resourceful, living on the edges of society. Her "Wasteland" skin is based entirely around this idea. Strap, pipe, and cannister designs in the skin were used to emphasize a character that was scrounging anything she could to survive. Several PR assets on Blizzard's press center website for Ana are labeled "Shrike" instead of "Ana", suggesting that her placeholder name during development was Shrike. The name Shrike was used for one of her epic skins, in which she wears a mask previously seen in pre-release easter eggs. Ana was teased on Temple of Anubis, with an opened document picturing her wearing her Shrike mask. Her scope could be seen being worked on in a GameSpot video. Also in the video was an early prototype with a modified Widowmaker model seen in the character selection screen, in the support section. The healing boost from Ana’s Biotic Grenade was providing too much healing, especially when used on targets with large health pools. The increased speed from Ana’s Nano Boost made the ability feel unstoppable and forced Ana players to select targets that could really take advantage of the speed boost. Removing the speed boost means that Ana has a reason to apply Nano Boost to a larger variety of heroes, and enemies can fend off the attack more easily. So far, we haven't seen any indication that Ana is too strong overall, but her ultimate charges a little too fast, especially considering the impact it can have on a match. Also, her Biotic Grenades are getting a small boost to help her hit multiple targets. While Ana has been very well received, she was showing to be a little bit weaker overall. In addition to helping her feel better to play, these changes should also increase her healing and damage output. After being out of the fight for several years, one of Overwatch's founding members is returning. Introducing Ana — a battle-scarred veteran who supports her teammates from a distance using a unique and highly specialized collection of weapons. ↑ Documents depicting Ana wearing her Shrike mask. Temple of Anubis. This page was last edited on 6 April 2019, at 04:06.